Pouring the second-phase concrete for anti-seismic bearing # 100. Notice the narrow space between the concrete surface and the bottom bearing plate, where the highly fluid mortar will be released. Workers from Nuvia Travaux Spéciaux (NTS) now do it an average of five times a day—a spectacular increase from the ten times per week average of mid-October. 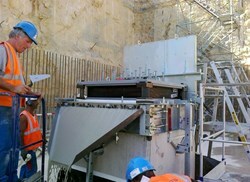 Still, although becoming routine, the installation of an anti-seismic bearing remains a delicate operation. Anti-seismic bearings, which are 18-centimetre-thick sandwiches made of alternate layers of steel plate and rubber, are essential to the seismic safety of the Tokamak Complex . Their function is to filter and mitigate the ground accelerations that a seismic event, should it occur, would generate. The basemat of the 300,000-tonne Tokamak Complex will rest on 493 of these anti-seismic bearings, arranged in a pattern that optimizes their efficiency. 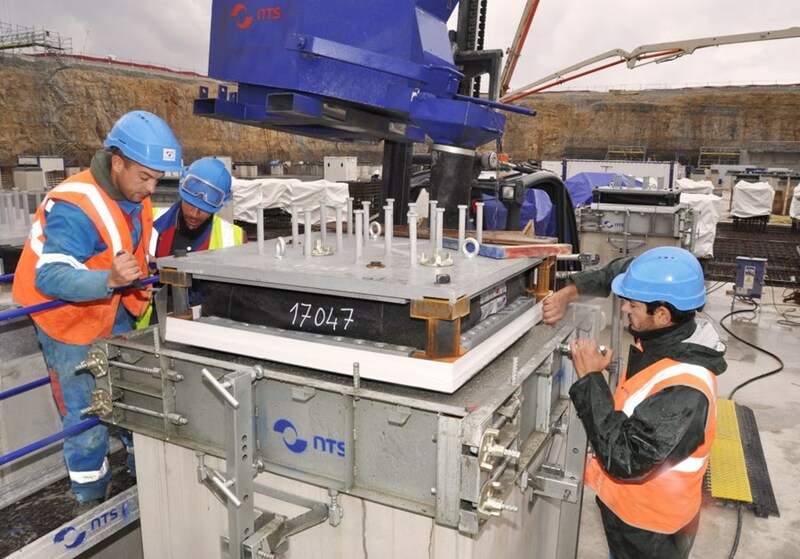 Last Thursday 3 November, a symbolic milestone was reached as the 100th anti-seismic bearing was installed in the northeast corner of the Tokamak Pit. Before installation begins, NTS, a French company based in Aix-en-Provence, has to accept each plinth. 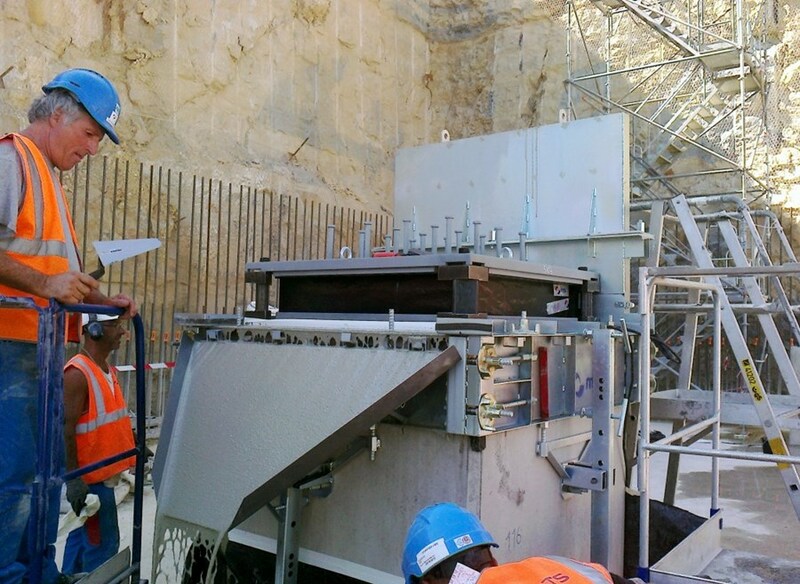 The acceptance procedure consists in checking the surface elevation, its roughness (which guarantees that the second-phase concrete will adhere perfectly), and also in verifying the precise height of the reinforcement at the top of the plinth. Cohesion between the plinth, second-phase concrete and mortar is essential to achieve the monolithic behaviour of the structure. "Tolerance for these measurements is very stringent—in the range of one millimetre," explains Mahaboob Basha Syed, the technical responsible officer for the anti-seismic bearings. "In civil construction works, this is quite difficult to achieve ..."
Once the acceptance procedure is complete, the bearing is placed on top of the height adjustment systems which enable the fine-tuning of position, level and inclination of the bearing. Topographical checks are then performed to adjust alignment and inclination. Plinth and bearing are now ready to receive the second-phase concrete. The concrete mix used for this phase is different from that of the plinth itself; it is self-compacting and much more fluid. Unlike ordinary concretes it does not require to be "vibrated", thus eliminating the risk of altering the pad's set position. "Despite the different phases of concrete," adds Basha, "the structure must behave as a monolith". Three to eight hours after the second-phase concrete has been poured, a final operation is performed: filling the small, ~ 25-millimetre-high space between the bottom bearing plate and the surface of the second-phase concrete (see photo). Some 100 litres of highly fluid mortar stored in a chute are instantly liberated by the vaporization of a polyethylene film previously acting as a seal. This small ''tsunami of mortar'' prevents the formation of air voids. NTS specifically developed this technique for ITER. The challenge during this operation is to prevent the formation of air voids which, however tiny, would weaken the plinth and bearing structure. This is achieved by way of an ingenious technique, which NTS developed specifically for ITER. A highly fluid, non-shrinkable mortar (a "grout") is poured into a chute whose bottom is sealed by a polyethylene film. "We need an instant gush," explains Basha, "and the best way to achieve this is to vaporize the polyethylene film with a strong electric current. 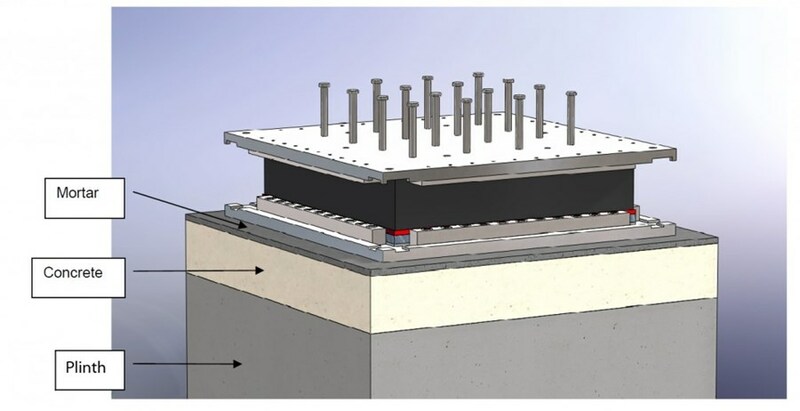 The film, which had acted as the bottom lid of the chute, instantly disappears and generates a small 'tsunami of mortar' that perfectly fills the remaining space between the second-phase concrete and the bottom bearing plate." This series of operations will be repeated 393 times before work begins, next April, on the upper basemat, the 1.5 metre-thick floor that will support the huge mass of the Tokamak Complex.